The course is designed for operators of passenger pleasure craft, wildlife charter boats, dive boats and charter yacht skippers who are likely to come into contact with marine wildlife as they are out on the sea on a regular basis. Attendees receive instruction in how to handle their craft while in contact with these animals, how certain species may react to the presence of boats, and ways to ensure marine life has sufficient room to carry on with their lives unimpeded. I’ve uploaded this informative video because it gives some very useful information about observing wildlife from a sea kayak around the coast. The video is about the marine sea kayaking code in Wales. This gives lots of useful advice when observing wildlife from a sea kayak. There are also a few safety tips as well as guidance and dates when sea birds and marine mammals are breeding. For those of us who sea kayak in Jersey there may be some variations in the breeding dates. However, it is surprising just how many of the species mentioned in the video can be seen in Jersey waters. Though some species are less common in the Channel Islands most of the advice is very useful when paddling around the coast of Jersey, the Channel Islands and UK. 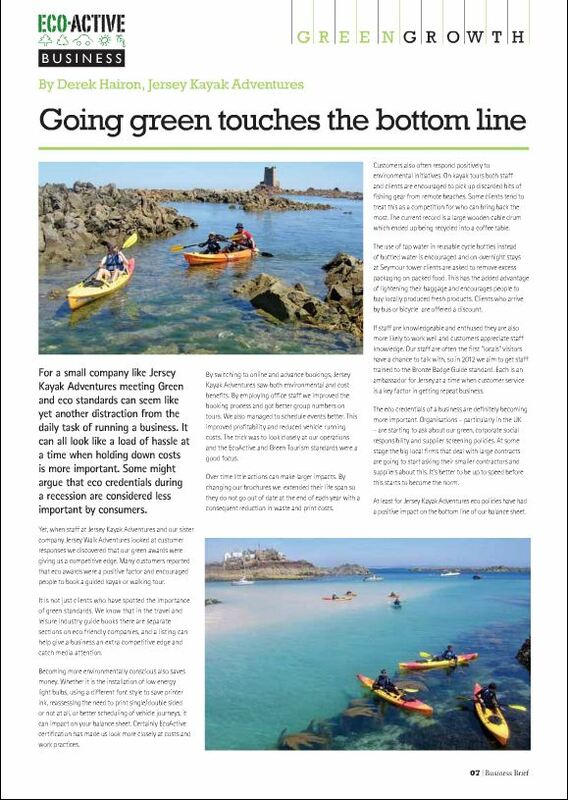 The Jersey Marine and Coastal Wildlife Watching Code and other Jersey wild life guidelines is on our Sea Kayaking in Jersey – A guide to good environmental Practice page. Produced by: Pembrokeshire outdoor charter. 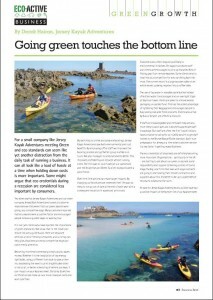 We just had an article about our environmental activities published in Business Brief, Jersey this month. I was asked to write the article to highlight how even small business can respond to Green initiatives. It was also to highlight how things are changing and the way environmental considerations can impact on business. We are already members of EcoActive Jersey and achieved Green Tourism Business Scheme (GTBS) GOLD grade. Read the article “Going Green touches the bottom line”.